As a global supply chain management company for metal products, we can supply an unlimited number of products in iron castings such as: grey cast iron, ductile iron, malleable cast iron and lost wax. We are a single source turnkey supplier of quality ductile iron parts from our domestic and global manufacturing partners. We can supply rapid prototypes and pre-series castings using full production processes, as well as producing serial quantities of fully machined ductile iron castings and sub-assemblies. We also specialize in providing iron casting products manufactured in China. Our years of experience in managing turnkey offshore castings has removed issues for our clients in dealing with: language barriers, poor service, unexpected pricing increases, invoicing, exchange rates, refunds, quality inconsistencies, time lines, production scheduling issues, and shipping requirements. 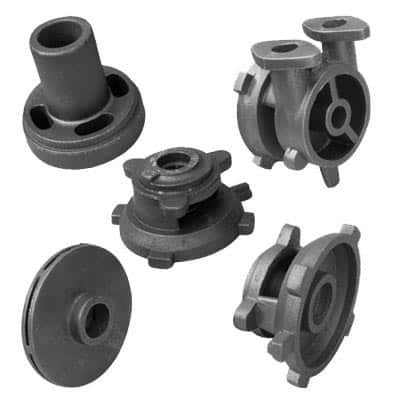 Some smaller iron casting parts include components as gears, pulleys, crankshafts, connecting rods, and propellers. Larger applications include housings for large equipment and heavy machine bases. Iron casting is also common in producing automobile components, such as engine blocks, engine manifolds, cylinder heads, transmission cases, and a full array of marine, agricultural, construction, industrial and Rail parts. Other Material: Steel, Aluminum, Brass, Alloys or as per customer requirements. Contact G&W Foundry for your next iron casting production project. When you choose our company, you are guaranteed to work with a Global leader in the industry. We will give you expert advice, and work with you to determine what is best for you.